Welcome to Oregon Coast Community College’s growing business program! 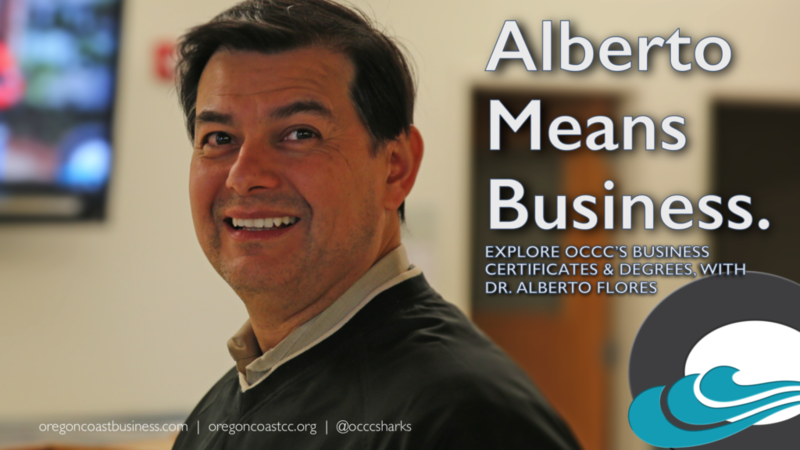 Please use this form to reach out to Dr. Alberto Flores, OCCC’s full-time business faculty, any time with our handy online information request form. He responds personally to all information requests about the business programs offered at the College. Our program offers a powerful lineup of business degrees and certificate programs. If you’re looking to earn a two-year transfer degree and pursue a four-year degree at (for example) Oregon State University, our ASOT-Business degree is for you! Consult with supportive advisors here at OCCC and regularly connect with advisors from OSU as you work your way through our cutting-edge courses, and be ready to join the College of Business in Corvallis as a Junior, in two short years. Or, explore our other two-year degrees, including Accounting and Administrative Assistant. These degrees are designed to arm you with the instruction and experience you need to compete for the very best job and career opportunities available in Lincoln County and beyond. And, if you’re most interested in ramping up your job skills quickly, consider our less-than-one-year Certificate Programs. In just a matter of months, you can acquire powerful new skills in spreadsheets, accounting and more – making you more productive at your current position and opening up doors to bigger and better opportunities in the job market. Use the links below to explore Oregon Coast Community College’s business degree programs. Use the links below to explore Oregon Coast Community College’s business certificate programs.